Inlays and onlays are a great option for damaged or decayed teeth that cannot be effectively treated by fillings but are not damaged enough to need a dental crown. These dental restorations provide more extensive support than fillings and are often used to improve the function and natural appearance of teeth. Drs. Jennifer and Cory Chambers of Cobblestone Park Family Dental understand that there is no “one-size-fits-all” solution to tooth damage and decay. They have helped hundreds of patients restore optimal oral health with various dental restorations, including inlays and onlays. Custom-made to match your unique specifications, inlays and onlays are strong and durable, and can last for many years. Inlays and onlays are dental restorations made of composite resin or a similar durable material. The main difference between inlays and onlays is the extent of repair they offer to a tooth’s structure. Inlays are smaller than onlays and are placed in the central area of a tooth’s chewing surface (between the cusps of the tooth). Onlays offer more support and cover most of a tooth’s chewing surface and can extend over the cusps. Whether you are in need of an inlay or onlay, you can rest assured that your dental restoration will be crafted using only the strongest and most durable materials and custom-shaped for improved functionality and appearance. It typically takes two appointments to create and place inlays and onlays. During your first appointment, we remove the decay and damaged tooth structure. The remainder of the tooth will be thoroughly cleaned. 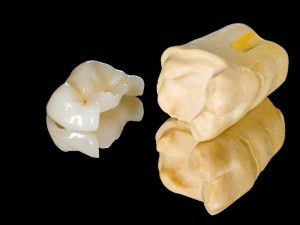 Next, we will make impressions of your tooth, which will be sent to a dental laboratory and used to fabricate your custom-made restoration. In the meantime, a temporary inlay/onlay will be placed to protect your tooth. You may experience some mild sensitivity to hot and cold foods while you wear your temporary restoration. This discomfort will disappear within a few days. Once your permanent inlay/onlay is ready, you will return to our office for placement. We will remove your temporary restoration and replace it with the permanent one. We will check your bite and, if needed, make any last-minute adjustments to your restoration in order to achieve a snug and precise fit. Your inlay/only will be bonded to your tooth using a strong dental adhesive. Inlays and onlays can last for many years, so long as you practice good oral hygiene. You must brush and floss your teeth regularly and visit us for regular dental exams and cleanings every six months. This is essential so we can monitor the health and function of your dental restoration. If a problem is detected, our team can address it promptly. To find out if you can benefit from an inlay, onlay or another dental restoration we offer, schedule a consultation with Cobblestone Park Family Dental. Contact us by calling (405) 603-8520 today.